Alderney is a small island in the English Channel, home to just 2,000 people and a few kilometres away from France. However, just offshore of Alderney, on the tiny islet of Burhou, the UK’s most southerly Puffin population make their home. The small colony of almost 200 birds return to Alderney in April after their winter out at sea, departing with their young in late July. The Alderney Wildlife Trust monitor the birds so we can keep track of their numbers, which have sadly been declining in recent years with a small rise in 2018. As part of this the Trust has live cameras on the birds so anyone can watch them from the moment they arrive and begin to build their burrows, to the parents birds bringing fish back and forth for the pufflings. So join us in 2019 and learn more about The Puffins! Alderney Puffin Cams - Watch live 24/7 stream of the Puffin Colony on small island of Burhou! Welcome to the Alderney Puffin Cams! 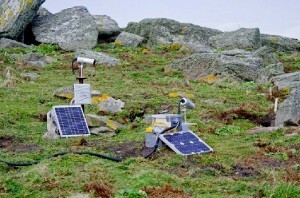 These cameras will show you the daily lives of the puffins living on the islet of Burhou, just off the main island of Alderney. 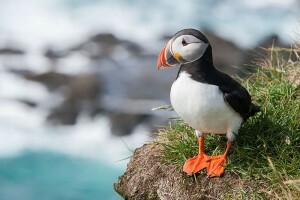 The Puffins lay eggs in old rabbit burrows on land and rest and gather in groups, known as rafts, on the adjacent sea. Soon the Puffins will arrive on the island after months out at sea, surviving storms and the cold winter in the Atlantic. Watch as the birds choose their burrow for the nesting season, clearing out any old grass, feathers and poo from last year with their bill and feet or even digging new chambers (look out for flying soil on the cameras!). Puffins mate for life, so the birds will come together for the breeding season and quite soon the female will lay her single egg. This will take a month to hatch so you will have plenty of time to watch the adult male and female go in and out of the rabbit burrow! Click on the links below to view the 3 Puffin Cams. 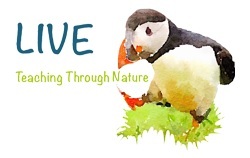 Click here to donate and support the Alderney Wildlife Trust Puffin Project!